A pleasant sail in mild conditions with Ross the greenkeeper and T3 aka Paz. While the numbers are a little sad I did a lot of work on over the handlebar dismounts . Few of you could match the grace and elegance that I bring to this unjustly neglected artform. With general fitness at 1 of 10 and sailing fitness at 0 today was hard work culminating in a downwind walk of shame to get back to derig . As something of a slow learner I will be back for more and am hoping to get a lot more sailing in this season. Mike here, uploading for Toby, just checking his new cable works, which it obviously does. Arvo at the fangy weed farm,... oh what fun!! Water smooth - wind was off and on. Guess we made the wrong call today. Forecast was saying wind wouldn't get far in land, so Hardie, Toby chef and I braved the liptons burgs. Things looked good around lunch time, wind was a bit ahead of forecast, which was due to keep picking up and peak quite late. So to start rigged a bit small to suss out the PT Grey burgs, (new 48, 5.4 with 19cm 55d deltoid), and hoped to be nicely powered when the wind picked up. Well the first part worked, I found that I couldn't sail through the thicker burgs, and the mud underneath is very black, very smelly, and gets every where. The picking up later thing failed to eventuate, water was too shallow to get into the real smooth, and the wind died there anyway. Should have joined Fangy and Pas at fangys. Even when I was plodding along, I had some dolphins come and play. Unfortunately, the glare off the water has made the video of no use. I found some nice bits of water to play in and I will post some snippets of video later. Great to see Basil and Fin out and about. A beaut warm Top Ten Fangy Day. The nauti run - nothing interesting, just to give an idea of conditions today. 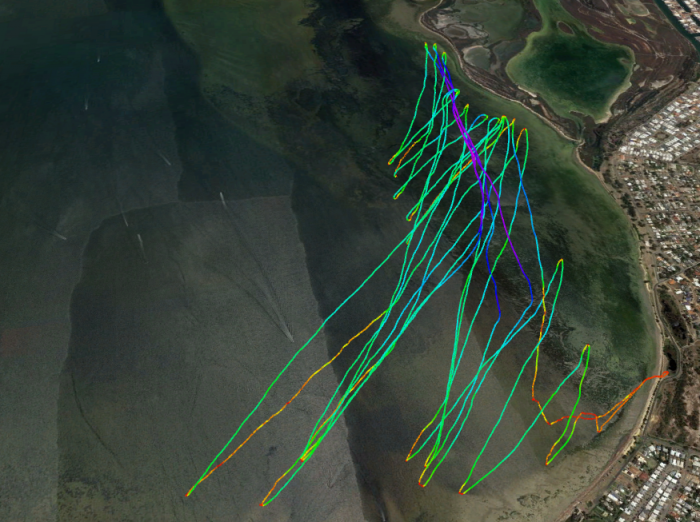 Unexpectedly STRONG optimistically went with 7m first up with a death run downwind back to base. Rigged 6.2m with plenty of downhaul which was just manageable. My last run back was balls to the floor! Tried out my new GoPro with the 7m combo and was more worried about losing it somehow than sailing propper. I'll get it sorted, grrrrhhhh.